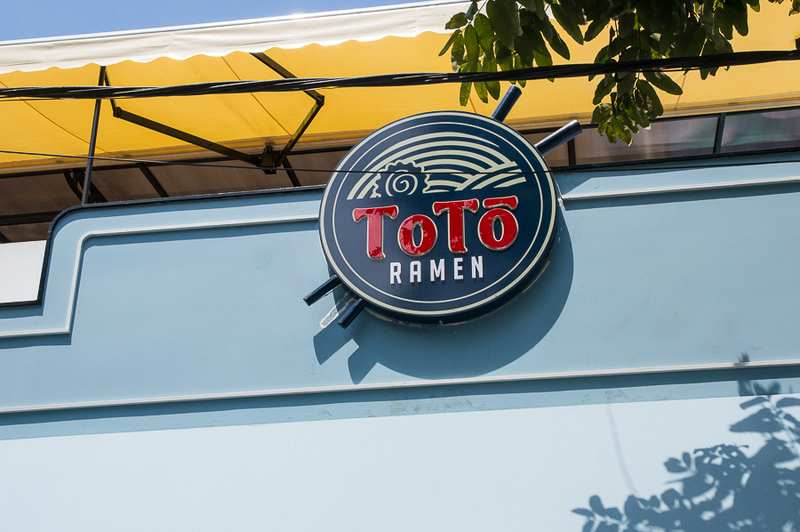 Justin and I recently went and checked out the new ToTo addition: ToTo Ramen. Apparently ToTo is expanding their ice cream store to create a mini empire including ToTo Ramen and soon ToTo BBQ upstairs. 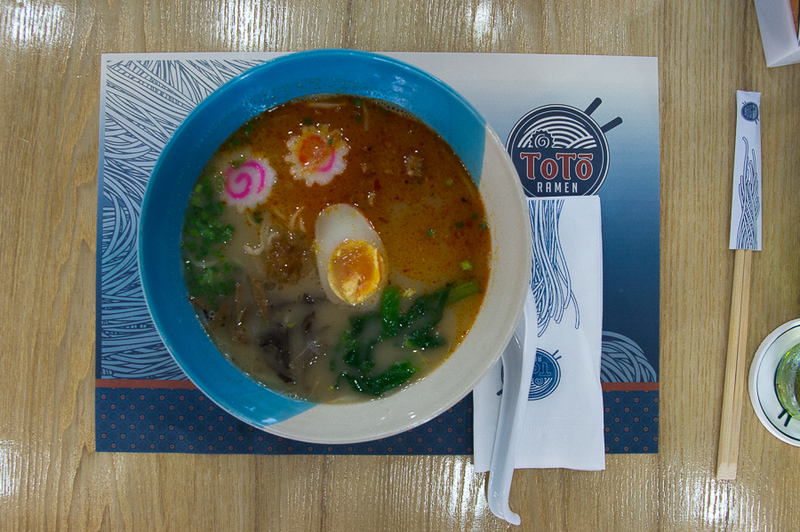 Personally, I’m not a big ice cream person but people that do like ice cream really like ToTo so I’m was excited to try their ramen. 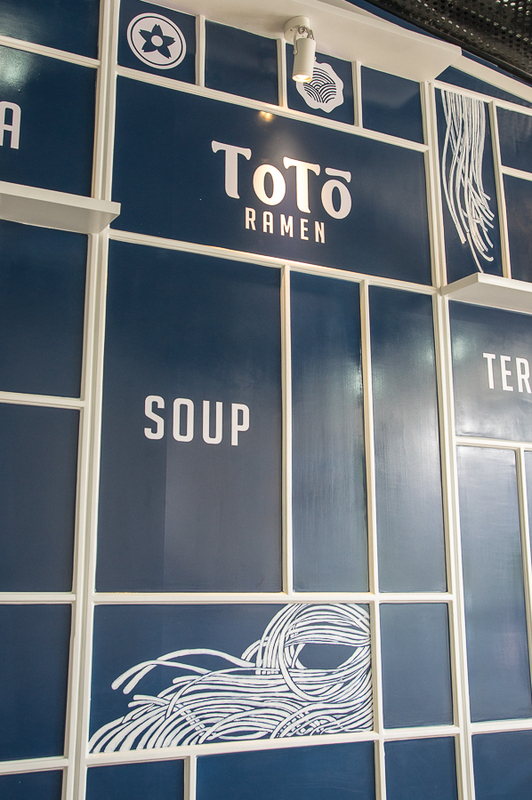 The shop was beautifully renovated and the ToTo Ramen logo looks like some weird Japanese manga storm of noodles which is pretty awesome. Having recently opened, the staff was a bit painfully under-trained but the manager was apologetic and promised things would improve. 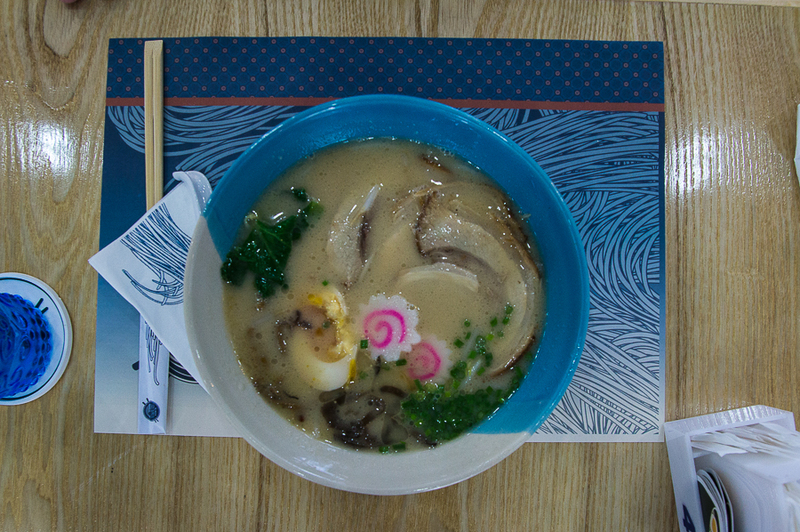 I went for the go-to miso ramen and received this bowl. 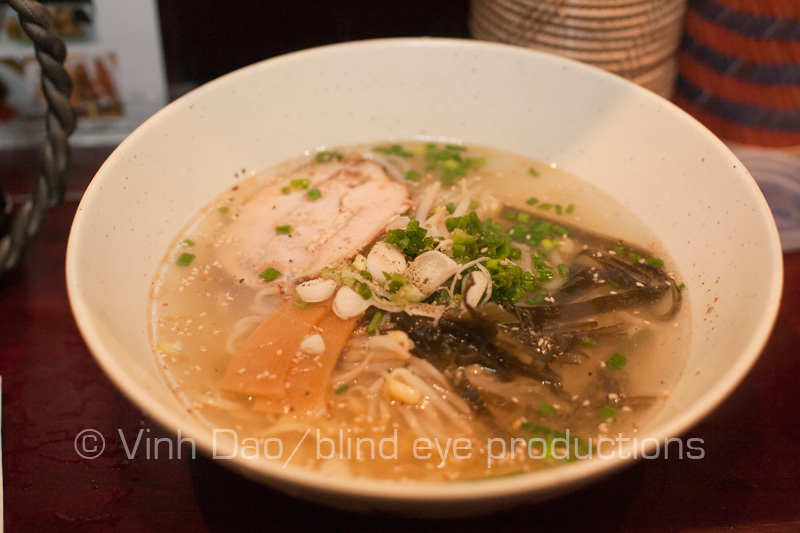 I had never really thought about it before seeing this bowl but ramen is typically served with a bit of presentation showing a mix of meat, veggies, and noodles like when we went to Bekkan Ramen. This presentation was attempted at ToTo but not quite as appetizing. As for taste, the broth was not bad but the noodles were nothing exciting. And it’s not cheap. They did give a 10% discount because they had just opened but then I noticed they slapped a 10% service charge on the bill which is kind of a joke. Maybe things will improve as they get the staff trained but I’m in no rush to return. Great signage and branding, shame about the food…. I’ve never really been into the whole ramen thing, not out of any dislike or anything, just naivety and lack of opportunity. So seeing a new place open up, and bill itself as a specialist in it, I was definitely interested in giving it a shot. 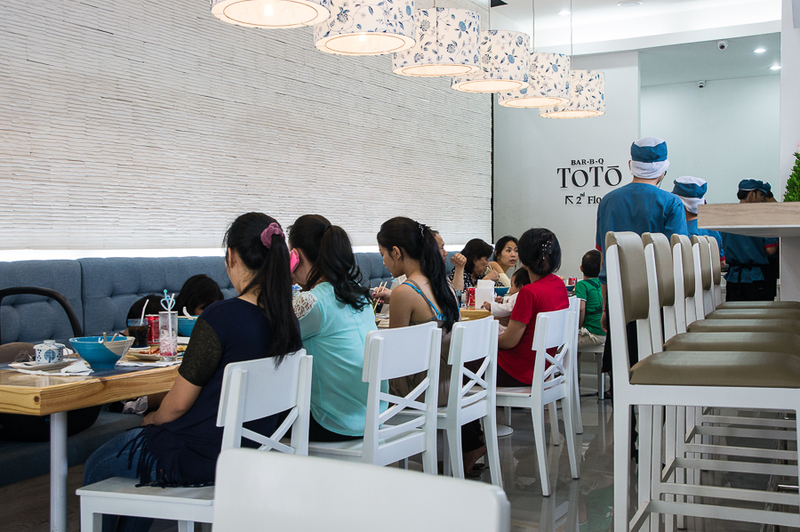 Given that ToTo has been successful thus far in their food-empire building, I assumed it would be a good introduction. They certainly have spared few expenses in the design and branding of the shop, inside and out it looks the part of a trendy lunch spot. Their picture based menu depicts all sorts of good looking dishes but I opted for the Volcano Meat Ramen mainly based on the name. I like volcanoes, I like meat, what could go wrong? It wasn’t so much bad as just not terribly appealing. It was also pretty short on the promised volcano of protein. Indeed the only volcano-esque element was the oily, brown splodge floating at one side of the bowl, lingering evidence of the small portion of now submersed meat (pork? beef? chicken? who knows). The noodles were ok, nothing special. To be fair, they had only been open for a little while when we went but it wasn’t much for a first impression. For $7.50 there are quite a few places around Phnom Penh where you can get a great bowl of noodles and soup. Actually, for $7.50 you can get several bowls at many of those places and still have some change. I think I’ll keep doing that. So it’s been over 8 months since I have moved to the homeland and a couple things have happened. I have started a blog here and it is going pretty well. I have also discovered that I can actually write something other than food stuff! So I am now a writer here when I am not taking photos around Vietnam. But it has been a while since I have been to Phnom Penh so when a 5 day holiday came up, I took the opportunity to head back to the old stomping grounds. I let Bryse know so I can see what’s new in Phnom Penh and he suggested we head off to a new Japanese place on the riverside. He also asked if I wanted to Nyam this. Why not I said! Osaka Ya is a pretty simple restaurant in terms of decor. When I walked in, I noticed Lina and was glad to see that Bryse invited her! So we had a bit of a catch up and let the waiter know that we will call him when we were ready. Bryse arrived a few minutes later and we started perusing the menu. 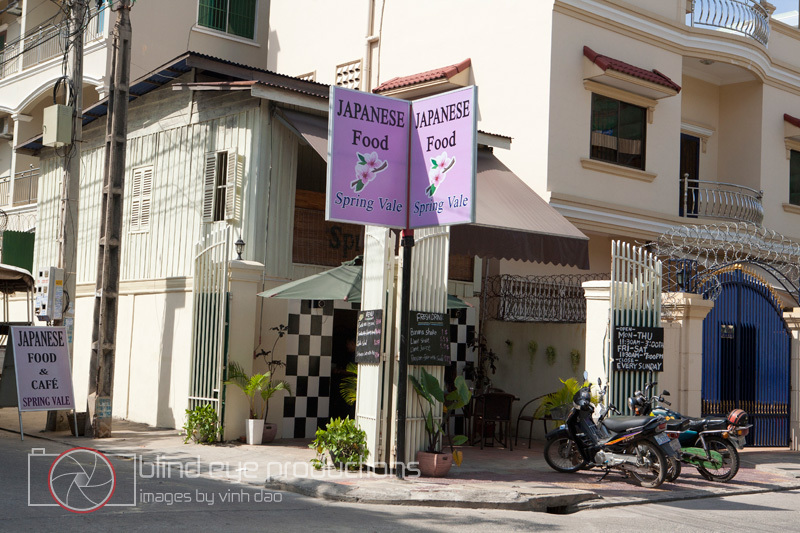 Typical of Japanese restaurants in Phnom Penh, there was ngiri rolls, rice bowls and set lunches. Lina asked what was in the Japanese lunch set and the waiter replied ” Rice and food”. Bryse and I went asian style and shared a few dishes and Lina threw caution to the wind and ordered the Japanese lunch set. 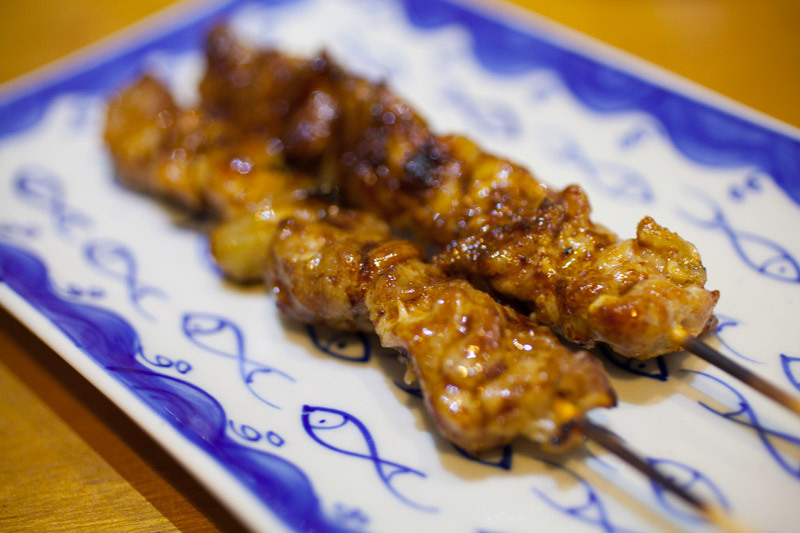 We started out with some yakitori. Chicken to be precise. They were really good. The chicken was tender and had a great sweet-spicy marinade. 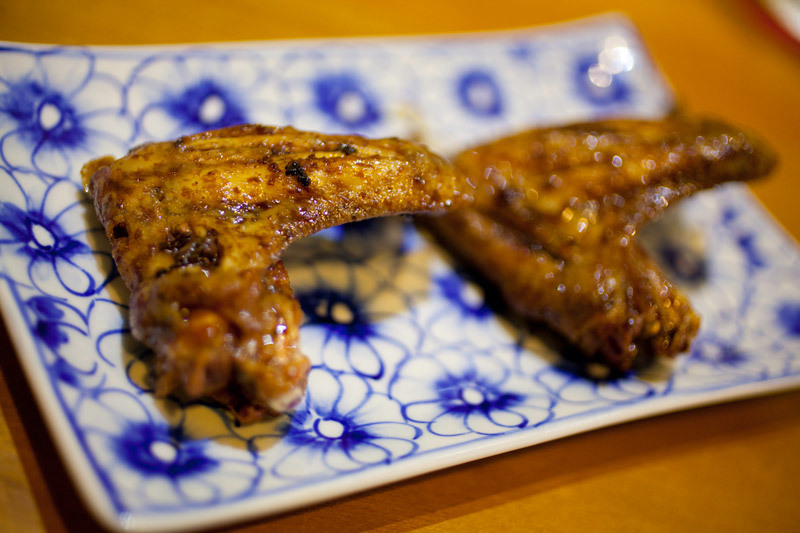 We also ordered some chicken wings which had the same marinade. Dusted those off with no problems. We had to wait a bit for our mains even though there was just one more table in the restaurant. Maybe it’s due to me getting used to Vietnam’s one hour lunches (Oh Cambodia, how I miss you for the two hour lunches) but I was seriously wondering where our food was. From what seemed like an eternity but was actually only 10 minutes, we got the rest of our mains. We ordered an okonomiyaki and a oyakodon bowl. 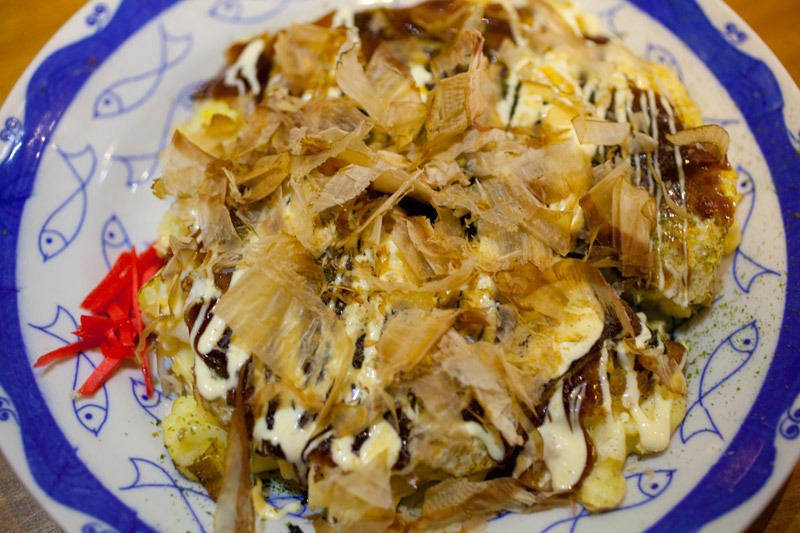 The okonomiyaki was a gut busting disc of goodness. Potatoes, cabbage, pork belly and octopus were fried on a griddle then covered in a pancake like batter. 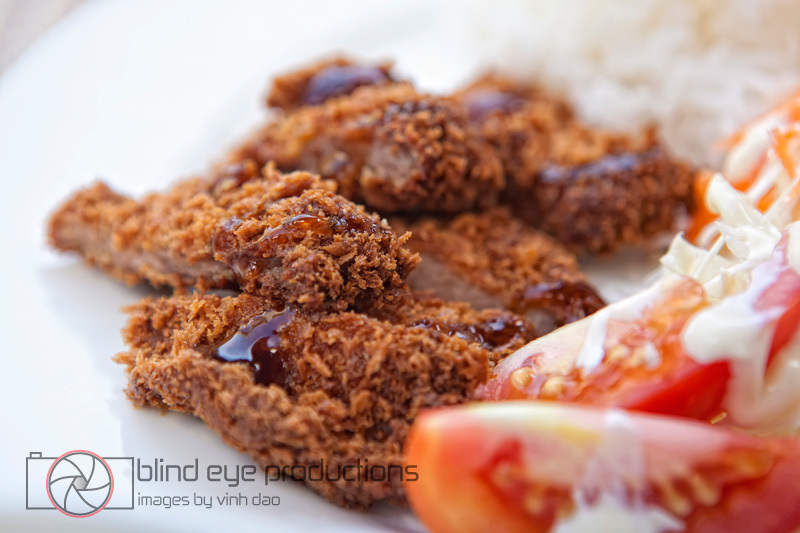 Mayonnaise and okonomi sauce was drizzled on top and a heap of bonito flakes. 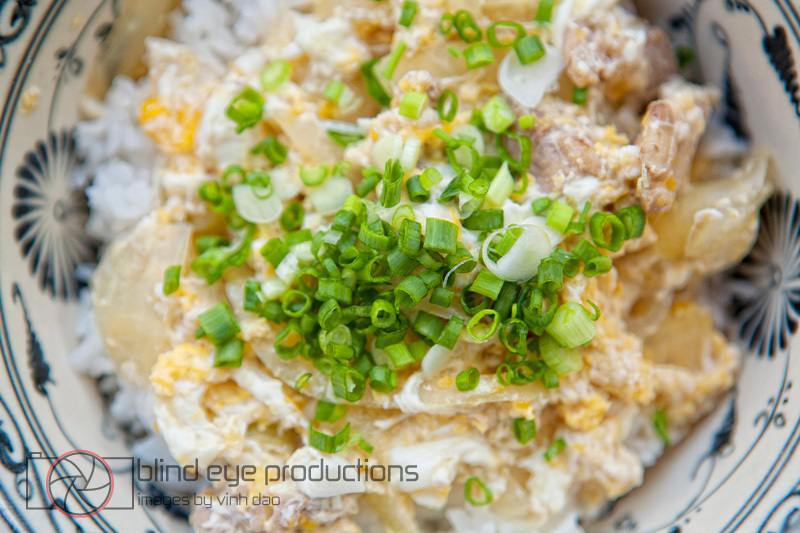 Despite the fact that the oyakodon bowl looked like one of the chefs puked onto the rice, I gave it a go and found that it was fantastic! Tons of chicken and egg covered a gigantic bowl of seasoned rice. It was about this time that Lina got her rice and food lunch set. 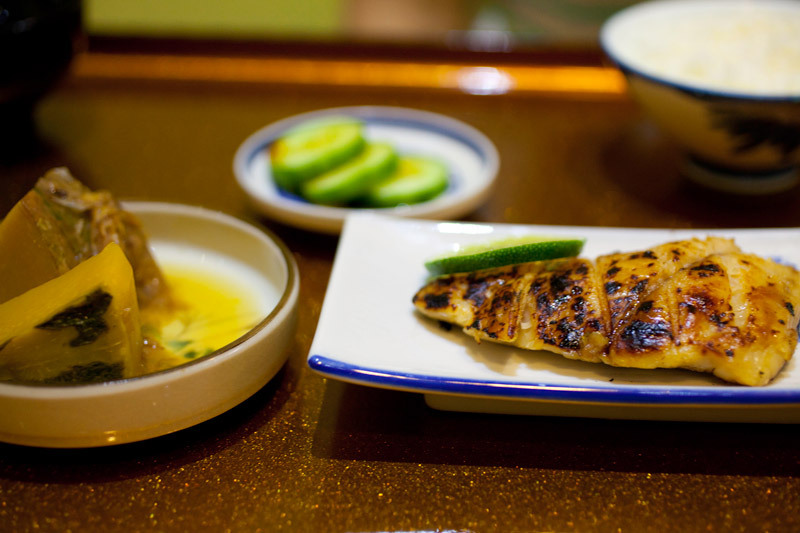 The food consisted of a grilled fish fillet, steamed pumpkin, some pickled cucumber and a small bowl of rice. I had a taste of the fish and it was pretty delicious. Each of us also received a small bowl of clam soup which was pretty tasty. Prices weren’t that bad and though we got some tasty food, I don’t think I would go back as the service was something to be desired. I had tried Osaka Ya a few months back, pretty soon after they opened, and they were still working through some kinks with the staff and the power cutting out every 10 minutes. But the restaurant owner was really nice and the food wasn’t bad so I wanted to give them another shot. When we arrived, the owner wasn’t there and the staff was definitely struggling. When Lina asked what was included in the Japanese lunch set the response was “… food.” Not incorrect, but not too helpful. I felt a bit bad for the guys waiting on us. They were really trying but were clearly in over their heads without the Owner. Despite these issues, we were able to get our order in and soon after the Owner arrived to help put together our lunch. The yakitori arrived first and the first thing that arrives always seems to taste the best but these things were pretty amazing. Lina had said that this is what Osaka Ya was known for and it’s well deserved. Really nice mix of chicken meat with cartilage. My favorite dish of the meal. The wings came next and I was expecting the same really delicious sauce as the yakatori but they were a bit different and not quite as good. The oyakodon bowl was really good. 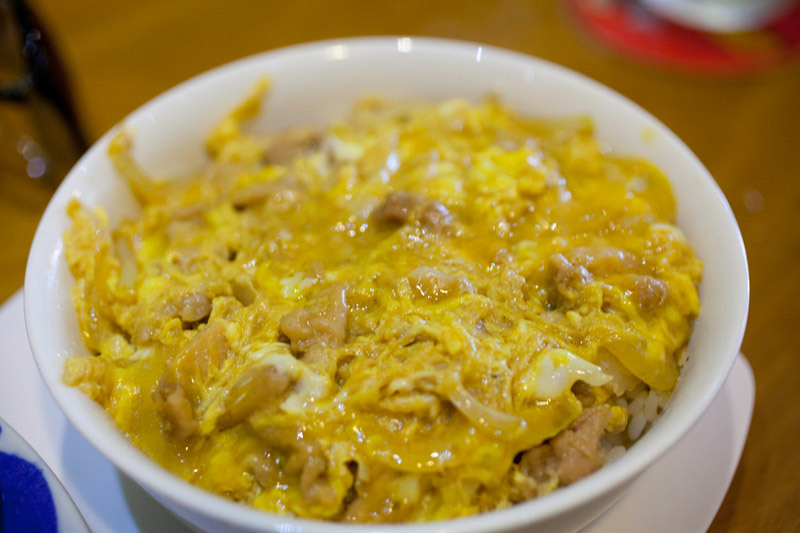 As Vinh mentioned, not the most appetizing looking dish but it was a great mix of eggs and chicken piled on Japanese rice. Okonomiyaki isn’t my favorite dish but this one was actually pretty good. But this may be because they placed the dish in front of a fan which blew most of the bonito flakes off of the pancake and all over our table. Overall, Osaka Ya is not bad but not the best Japanese place in Phnom Penh. 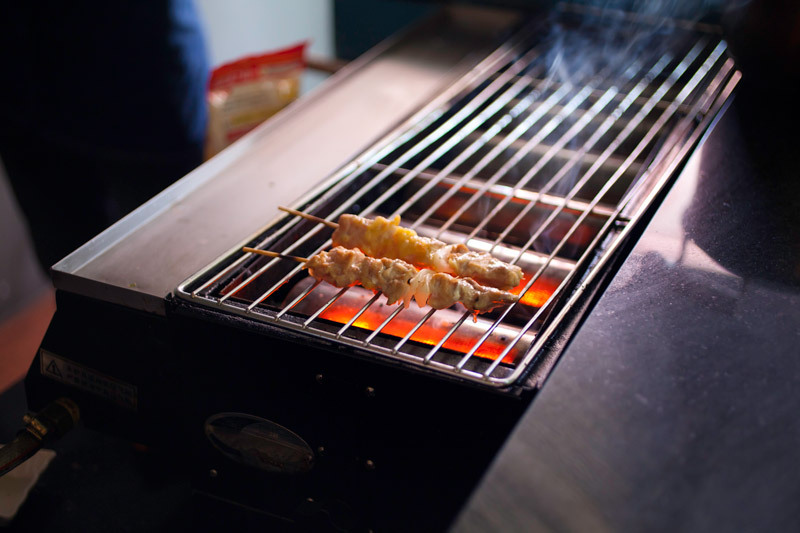 I would recommend checking it out for a few yakitori skewers and their “Happy Time” beer special. Tucked around the corner from Russian Market, I had heard of Spring Vale from a couple of friends that live around the corner. After reading Lina’s review of the place, we knew that this had to be the next place to try out. We were greeted by one of the owners upon walking in and were offered a table outside. Not one to turn down al fresco dining in December, we grabbed the nearest table and were given menus. It’s one of those laminated jobs which doesn’t mess around. All the dishes range from $3 – $6 which is very reasonable for it’s proximity to Russian Market. 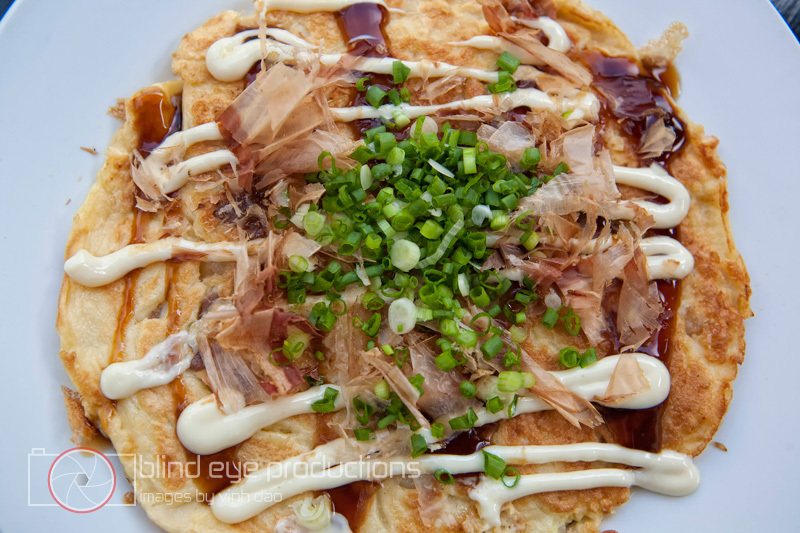 The Okonimyaki was very tasty and didn’t have an excessive amount of the okonomiyaki sauce which can sometimes overpower the rest of the ingredients. The gyoza were quite ordinary but what I really loved (and was probably the least appealing looking) was the chicken and egg on steamed rice, otherwise known as oyakodon (thanks Nathan!). I could imagine this meal being something your mother served to you after you scraped your leg while playing in the street. The egg was runny enough to imbue it’s taste onto the rice and was seasoned perfectly. The fried tofu was a also a hit for me. 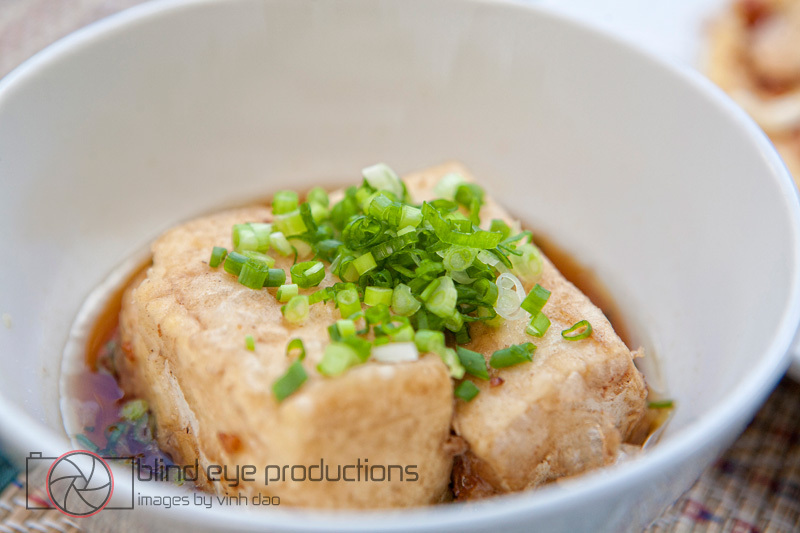 The tofu had a nice crisp crust to it and had a great melt in your mouth texture once you bit into it. The fried pork came with rice and a pretty good side of coleslaw. I thought the pork was a bit overfried and needed the sauce to keep the dish from being too dry. I am generally a fan of anything fried and pork but this one kinda fell flat for me. Maybe I dug the chicken a bit too much. As Lina put in her blog post and I mentioned before, Spring Vale isn’t a fancy shmancy restaurant serving avante-garde fare. It serves items you would probably find in a home or casual eatery. And sometimes that’s all you need. 3 out of 5 nyamies. 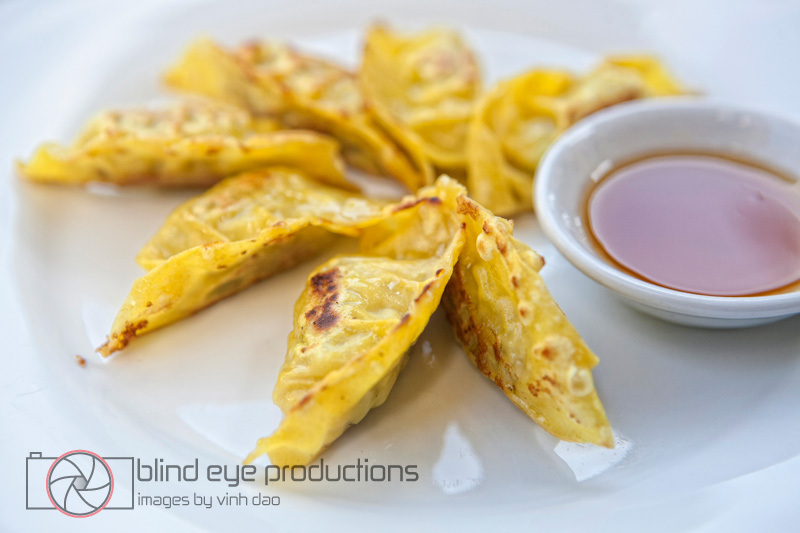 Whenever dumplings are on the menu at a restaurant we order some and use them as a yard stick for the food. Unfortunately, the gyoza at Spring Vale was disappointing. Not that they were bad, we have definitely had way worse chinese style dumplings close to Central Market, but gyoza is usually really great so it was surprising when these were a miss. Most of the other items were pretty nice. I could see having the chicken and eggs on steamed rice for breakfast. Nothing special, just a solid bowl of good food. The okonimyaki was also really tasty. It is served fully cooked and it’s always more fun to see it fried on a table in front of you (while the cook is flipping pieces of food into your mouth Benihana style). A friend had just been talking about homemade tonkatsu so I was really excited to order some when I saw it on the menu. The breading and sauce was pretty fine but the breading to pork ratio was too far in the breads favor. Not much meat in those things. The folks serving the food were very nice and none of the plates we tried were bad. If I lived close or am in the neighborhood, I would probably check out Spring Vale again but I’m not going to drive down just for this place. 2.5 out of 5 nyamies.